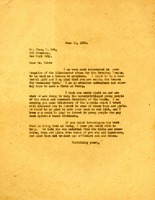 Martha Berry writes to Mr. Bob saying that she is interested in his donation of the illuminated cross for the Broadway Temple that might also serve as a beacon for aviators. She says that she is an aviation enthusiast and hopes to have an airfield at Berry someday. She also tells him more about the work at The Berry Schools, saying that she knows he would be interested in investing the boys and girls at Berry.